NatraBio Hot Flashes/Menopause is a homeopathic product for the treatment of hot flashes and menopause that is based on traditional homeopathic theory. Active Ingredients: Cimicifuga racemosa 4X, Sanguinaria canadensis 4X, Ignatia amara 6X, 12X, 30X, Helonias dioica 6X, Sepia 6X, 12X, 30X, Oophorinum 12X, Lachesis 12X. Otherwise no additional active ingredient information provided. Inactive Ingredients: cellulose, dextrose, lactose, magnesium stearate. Otherwise no additional inactive ingredient information provided. Chew one tablet and allow to dissolve in the mouth every 2 hours until symptoms improve, then take 4 tablets daily or as needed for continued relief. $8.99 for a 60 tablet bottle (a 15 day supply). The product vendor offers a 30 day money back guarantee and provided a contact number in the product source. This product is relatively inexpensive for a limited supply (15 days). Otherwise the product source provided little information on product use or results (no product testimonials) and limited information on ingredients. For these reasons it is hard to say if this product will provide the results users may want. 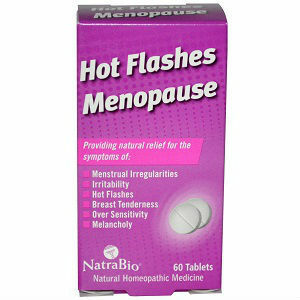 Jackie Horowitz	reviewed NatraBio Hot Flashes/Menopause	on February 7th	 and gave it a rating of 2.